You always hear that you will never forget where you were on 9/11/01. I can attest. September 11, 2001 started as any other Tuesday morning would for myself, at the time a junior in college at Appalachian State University in Boone, NC. I was in an art class, when the news broke of the first plane hitting tower 1. I remember at first that it really didn't sink in, as to what was really going on. But once it did, and I saw the news, I was taken back, and scared. It has become the one moment in history that I will never forget. I will NEVER forget that day, nor all the lives that were lost. Today, when I watch coverage of this horrific day, I still feel sick to my stomach, just as I did seventeen years ago. We just had a moment of silence here at work, in remembrance of this day. Just as it did seventeen years ago, my heart still aches for our country and the tremendous loss that occurred. Although our country had just suffered a huge trajedy, you couldn't help but notice our country coming together as one. We were UNITED, as it should be, THE UNITED STATES OF AMERICA. 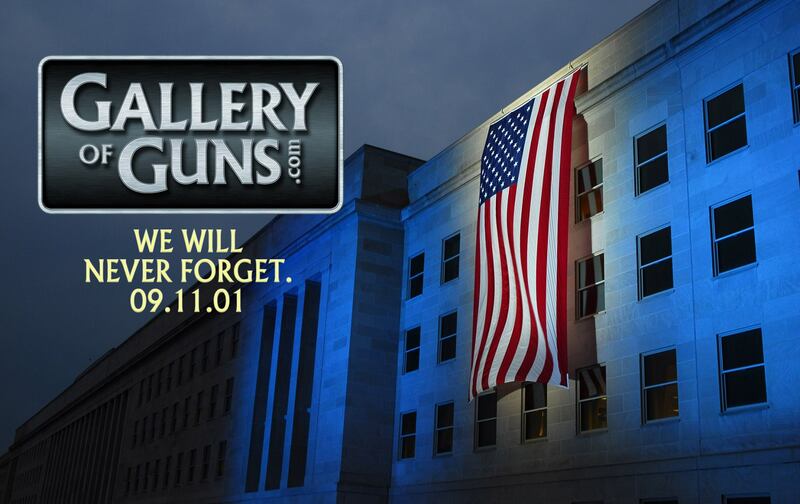 We at Galleryofguns.com are privileged to be part of the greatest country in the world. We will never forget.